An opening reception will be held on Friday, Oct. 2, 6-8:30 p.m. with an Artist's Talk at 7 p.m. RSVP requested by Sept. 28. "You enter the forest at the darkest point, where there is no path. Where there is a way or path, it is someone else's path. You are not on your own path. If you follow someone else's way, you are not going to realize your potential." Just as our life’s journey is in flux, so too is the landscape. When I started photographing Goose Creek in 2012, I captured beautiful spring greens, blue water, summer light, colorful fall foliage and white winter. However, in the Spring of 2014, Loudoun County had so much rain that the water was coffee brown. That was followed by so much overgrowth I had to push my way through foliage to get a peek at Goose Creek. Finally summer green showed its face. Winter 2015 was so cold, but crisp and sharp. Again, the 2015 spring brought violent storms and lots of water. Goose Creek had still another view. The water was a murky green-brown which I think was runoff from the ice and snow. My exhibit covers my interpretation of the four seasons over the span of 2012 through 2015. Hopefully the viewers will be able to put themselves in these landscapes and be reminded of their own journeys -- sometimes the view is murky; sometimes pleasant and colorful; often the view is obstructed; and at other times clear blue, crisp and sharp. H. K. Anne is an American Landscape Artist based in the greater Washington DC area. Her paintings continue in the lineage set by the Hudson River Valley artists of the 19th century, yet record the changing landscape in the 21st century and the emotional connection we have with our environment. 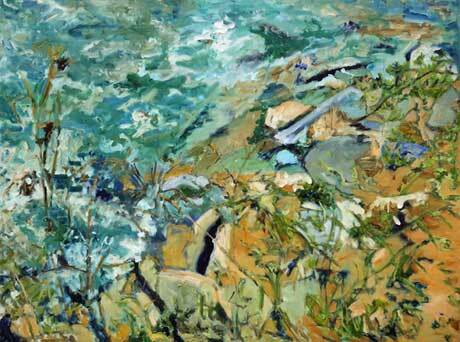 Many of the landscapes Anne paints have changed immensely due to development, climate change and natural disasters. Just as our lives are in flux, so, too, is the landscape. Anne is interested in this ever-changing, shrinking landscape, and translates these images to canvas via charcoal, turp, varnish, stand oil and pigments, conveying a feeling rather than a place. H. K. Anne has an MFA in Painting from Western Connecticut State University and a BA from Sarah Lawrence College focusing on 19th Century European Art History and Studio Arts. Originally from Indianapolis where she was a docent at the Indianapolis Art Museum for 15 years, Anne lived in Ridgefield, CT for eighteen years and now resides in Haymarket, VA. A studio artist at the historic Workhouse Arts Center in Lorton, VA, she was recently awarded “Best in Show” honors at The Art League, Torpedo Factory in Alexandria, VA. The exhibit hours are 7 a.m.-9 p.m., 7 days a week. Please contact building security to ensure access at (703) 726-3511or (202) 815-9741. For more information please contact the Office of Corporate and Community Relations by email or by calling (571) 553-5002.